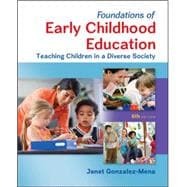 Foundations of Early Childhood Education: Teaching Children in a Diverse Societyis designed to help increase the quality in early care and education programs through training teachers. It features skill building with a solid theoretical base,a nd provides students with an overview of early childhood programs through the use of examples, anecdotes, and scenarios. Readers will come away with an understanding of what makes a quality early childhood education program, where children gain the foundations they need for school success and beyond.